Internet is a necessity nowadays, and no one denies that fact. From social connections, to TV and its alternatives, and even the news that we read; it’s already on the internet. And here in the Philippines, the need for internet is much greater. With the Philippines being ranked as one of the top users of social media, it’s no surprise that we internet is something that Filipinos cannot live without. 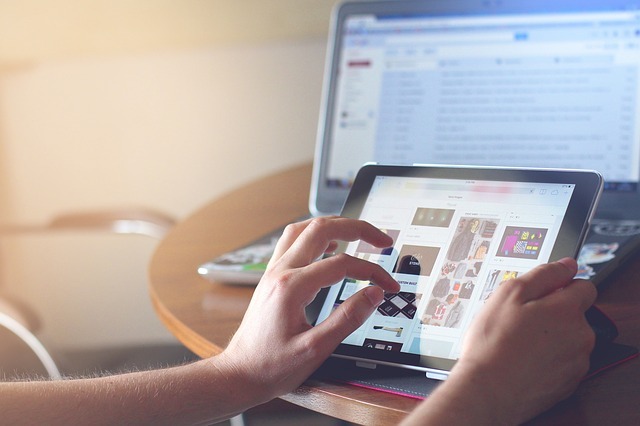 With that in mind, it’s essential to know which is the best internet service provider in the Philippines so that you’re sure that you’re connected to the internet all the time. There’s plenty of healthy competition in the Philippines when it comes to providing internet service. And basically, all of the internet service providers (ISPs) are in an arms race in providing a fast connection all the while being stable and reliable. It’s definitely a hard balance to keep, but there are a lot of players that are good enough to make choosing a little difficult. So if you’re still on the fence as to what provider to choose, let me help you. Here are the Best 5 Internet service providers in the Philippines right now. To make this list, we’ll have to take a look at some metrics so we can rate the ISPs better. We’ll be looking at Price and Speed/Reliability that they provide. We’ll also be looking at residential rates and residential services, not business rates and services. I think you might have expected PLDT to be on this list from the start. Though there has been some negative feedback to this ISP due to spotty connections, it’s still one of the best ISPs in the Philippines right now. The Philippine Long Distance Telephone Company, commonly known as PLDT is one of the oldest companies in the Philippines and it owns a large share of the total internet users in the Philippines. 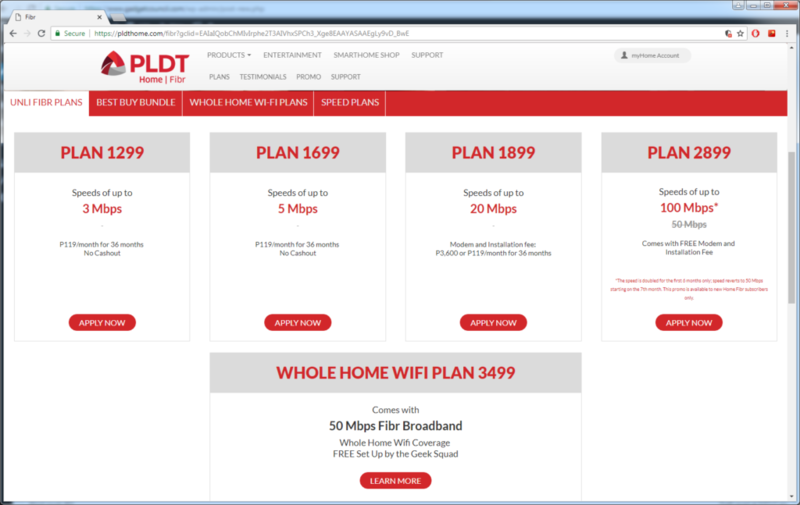 With it’s PLDT Fibr connection, speeds up to 100 Mbps are offered at reasonable price points. Let’s take a look at the prices that they have to offer as of now. Of all of the ISPs, PLDT is the most accessible. Because of the cables that it has laid out throughout the years, anyone in the Philippines will most likely have easy access to PLDT internet service, especially if you’ve had a PLDT connection before. The Fibr connection, however, may be subject to availability. Personally, I’ve had difficulties getting a slot to get a Fibr connection. In terms of speed and reliability, PLDT Fibr does have a very competitive speed and they even double the speed that they provide to you for the first couple of months. However, for reliability, there are times that PLDT has a spotty connection. The most notable time that the internet was spotty was when one of the deep sea internet cables was cut and caused intermittent connections all throughout the Philippines. Essentially, if you use PLDT, you are signing up with the company that is the oldest in the business. There’s not much that can go wrong, except for those one-time outages. Globe is one of the telecoms that started the mobile craze in the Philippines. In the early days, most everyone has a Globe SIM card and the company capitalized on that brand recognition to provide internet service. The internet service that Globe provides is not even half bad, and it does have choices that can be the best fit for you. Aside from the basic cable internet that they provide, they also have a prepaid variant that might work well for you. It all depends on how you use your internet, whether sparingly or all the time. 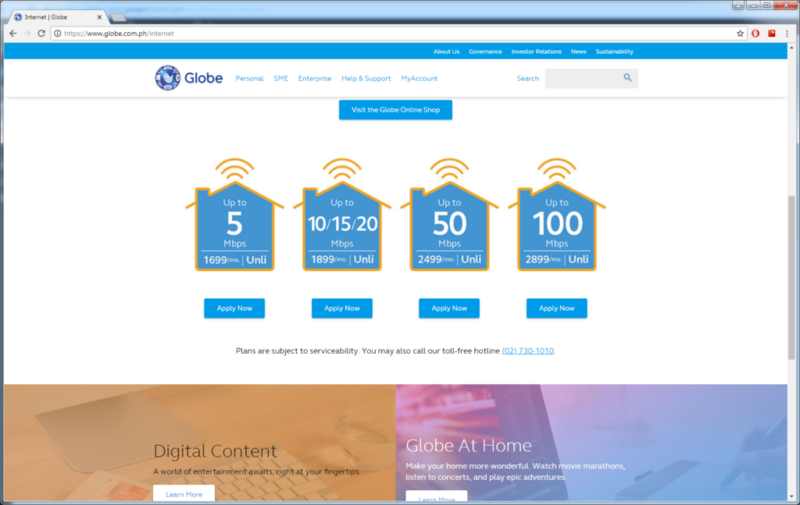 Let’s take a look at their cable internet service: Globe Broadband. Globe Broadband provide one of the most competitive prices for the faster speeds. If you’re looking for the fastest speed possible at a good price, this ISP might be for you. If you sign up to their top of the line service, you not only get a speed of 100 Mbps, you also get an unlimited data cap. The best part of that is that the price is the same as the 50 Mbps offers of other ISPs but you get double the speed. That’s not too bad for me. The only caveat with Globe is that it’s not available everywhere as of now. Though they do have a very large coverage in the Metro Manila area, those in more rural and provincial areas might have difficulties signing up with them. Still, with their speed and price ratio, Globe Broadband in undoubtedly one of the best ISPs in the Philippines right now. In the ISP landscape, there is one rising star that everyone is talking about: Converge ICT. The reason as to why it’s the talk of the town is simple: it’s very affordable and there’s no data cap. Personally, those are two of the things that have won me over to try this new ISP. If you look at the 100 Mbps package, it’s not really that spectacular. Other ISPs are already providing 100 Mbps with no data cap. And I’m sure that you can switch to either ISP and not feel a thing. However, where Fiber X really shines is it’s the lowest package. 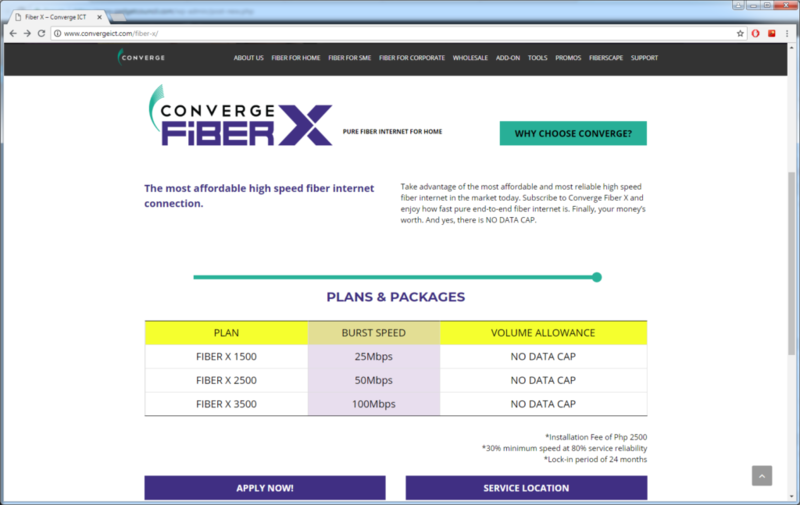 While other providers are touting 10 Mbps at around the 1500 Php price point, Converge ICT wins this price category handily; for your 1500 Php, you can get 25 Mbps. That’s the true bang for your buck. Since Converge is a newcomer to providing residential internet, it is going to be difficult to get a connection with them. However, if you’re in the Metro Manila Area, you’re going to be seeing marketing materials saying that they’re available. Converge ICT coverage is expanding and you should give it a try if it’s available in your area. 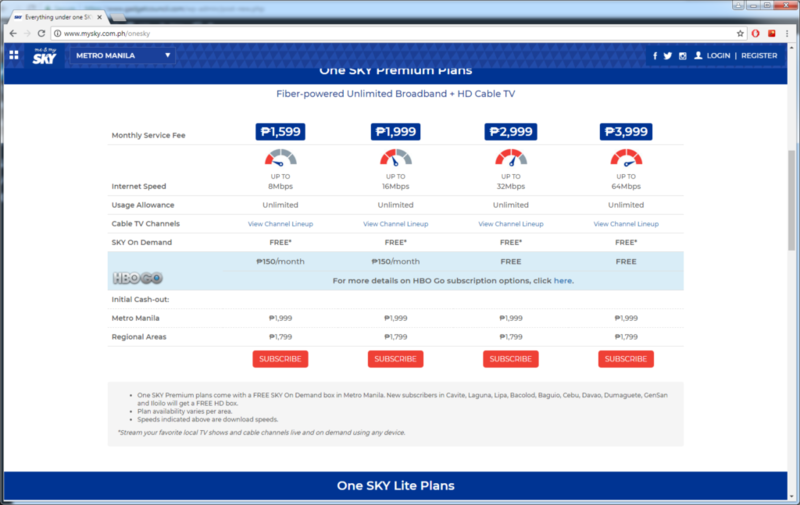 Another big player in the ISP game is SkyCable. When they initially offered internet service, SkyCable was heralded as one of the fastest ISPs on the internet. To be honest, Sky Cable does not really bedazzle with the internet speeds. 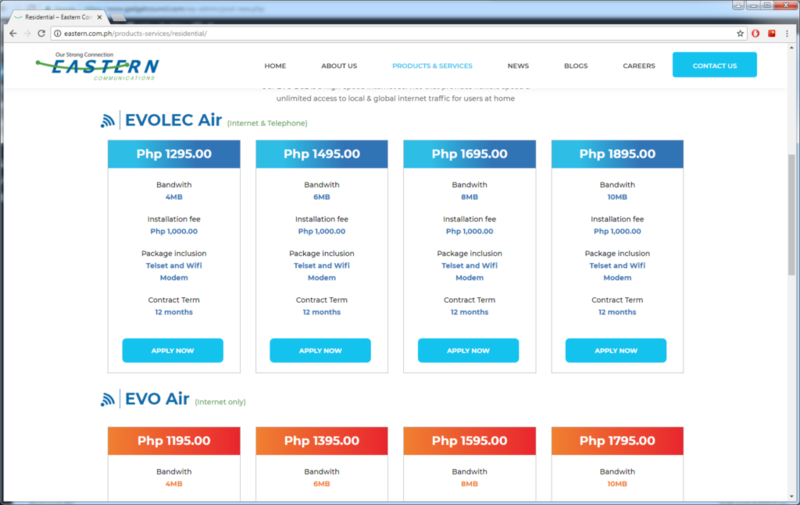 With your 1599 Php for the lowest package, you can get other providers to give you a fast internet service. BUT that’s only if it’s just internet that you’re after. If you want a full entertainment experience, it’s actually a good service. You get popular shows with the channels and the number of channels increases up until the 3999 Php offer. Once you’re at the 3999 package, you get 64 Mbps unlimited internet and the highest TV package. To make it simple, if you want entertainment that even the oldies in your family can enjoy, get Sky Cable. It’s not only one of the best ISP providers in the Philippines, it’s also one of the best Cable providers. If we’re talking about ISPs that have the potential to be big, then Eastern Communications might be it. The company has not been making a lot of strides when it comes to marketing, which is why not a lot of people know about this ISP. However, it’s still a quality service and it’s acclaimed across the internet. EVOLEC Air is one of the best options if you’re looking for a combination of phone and internet. While other providers would offer the same service at the same price, EVO Air is known for having a very stable connection. This effectively makes them one of the best internet service providers in the Philippines. The only caveat is that their coverage is not that great. But of course, they could easily expand. And at that price point, it’s fairly easy to jump in. The ISP that you choose is up to you. It depends on many factors like what you do on the internet and your entertainment preferences. In any case, you can’t go wrong with any of the ISPs listed here!